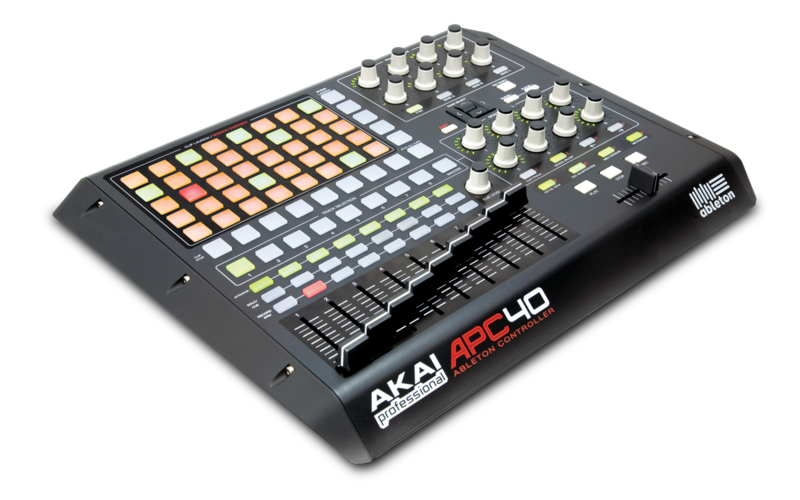 APC40, PAD Controller from Akai in the APC series. Product replaced by the Akai APC40 mkII. sw80's review"buy it and use it carefully "
If you are an Ableton Live user then you need to go out and buy the AKAI Professional APC 40 as soon as you can, it is a USB based controller that has a total of 109 different buttons! 9 different faders and a cross fader and it is compatible with Macs and PC’s. This is the best performance controller for Ableton Live by far in to me. 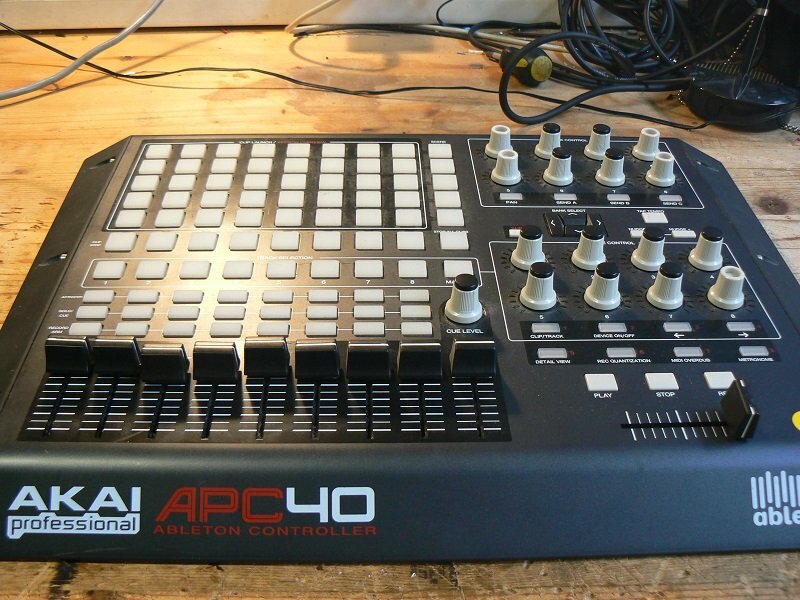 The APC 40 is made to use with performing, if you need hands on control over Ableton Live then you must have the APC40, there is also an APC 20 which is about 100 dollars cheaper but it is missing some pretty key functions. 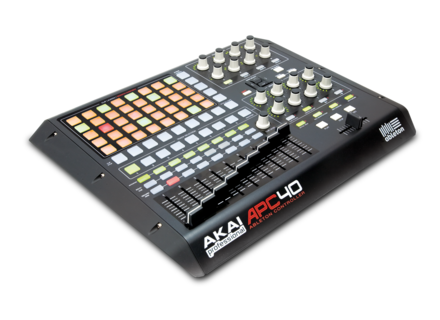 On the APC 40 there are a total of 40 clip triggers a cross fader, tap temp and 16 knobs. The APC40 is easy to set up and its plug and play so if you are a live performer you will have no problem showing up, plugging in and start rocking the house effortlessly. Because this is made for Ableton Live the set up process could not be quicker, it basically does all the work for your when installing. Outside of all of the cool features of the APC 40, there is a huge issue with it. The problem is that it is not well built at all. The knobs are very cheap and will break off if you use it a lot and travel with it a lot. I don’t see this unit lasting someone who uses it a lot and travels with it, more than 6 months without it falling apart. 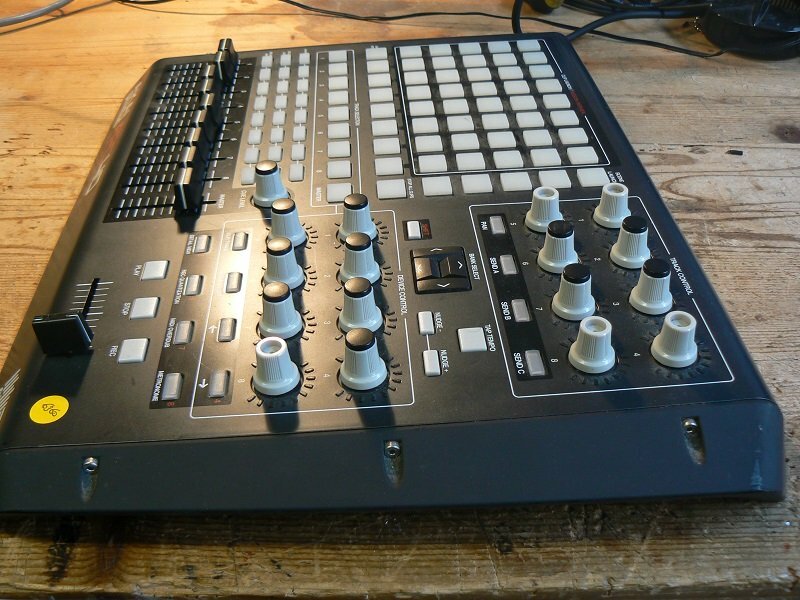 If you do lose a knob or two it will not make the APC40 stop working but it will or could affect your performance and most definitely the look of the APC40 with missing knobs. Also the “nudge” button isn’t well but. Seems like if you put a little to much stress on it changing tempo’s then eventually it will come off and not hold up for you. The APC 40 is a must have but use it with caution and don’t be surprised if you take it somewhere to perform and come home with missing knobs and buttons. The Akai APC40 is a unique MIDI controller that's designed for use with Ableton Live. Ableton is a DAW that's becoming more and more popular and for good reason as it's really intuitive and easy to use for creating music in the box. The APC40 makes this process even a little bit easier as it gives you access to controls in the DAW on an external piece. It's perfect as a controller for live shows if you're using your laptop on stage. I only recently got to try out the APC40 with Ableton, and while Ableton isn't my main DAW since I don't do all that much music creation in the box, it's a great tool for those who are using Ableton on a daily basis. You can control pretty much everything in Ableton using the APC40, as it's got nine faders (including a master), buttons for clip control, knobs for track and device controls, as well as transport and channel controls. It's pretty in depth with everything that it can do but if you know Ableton Live well, I don't think you'll have a hard time adjusting. Since I don't use Ableton all the time, it'll take me a little more time to get used to using the APC40, but I think those a bit more experienced will feel pretty comfortable with it. The price is about right for the APC40 considering all that it brings to the table and it's nice build. Of course for it to be worth it you should be using Ableton a lot as this doesn't work with other DAW's that I'm aware of, or least it's modeled after Ableton and wouldn't really translate over. For those who do have Ableton Live, definitely check out the APC40 for hands on control of your DAW. <div> <span style="font-family: 'Lucida Grande';"><span style="white-space: pre-wrap;"><span style="font-family: 'Lucida Grande', Arial, Helvetica, sans-serif;">How long have you use it? - I use it for almost one month Have you tried many other models before buying it? - I have not tried many controllers noon to hand a master keyboard oxygene49, so nothing to see. on the other hand, a few days after purchasing my APC-40, I bought a home Akai LPD8 (40 €), which erases all the faults of the beast (defects of which I speak later). I want to clarify that I discovered Live along the machine! With experience, you do again this choice? - With experience, I do it again this choice because there is no machine in this price range that would introduce me to live in so little time and so intuitively. What thing do you like most and least? + Intuitive, no mapping to + solid appearance, good looks + precision controllers + No need to be glued to his computer + is monitored while a wink, it's perfect for creating like to play Live - Missing a few buttons for switching on / off the different effects of Live (that's why I bought the LPD8, no problem) - Size large, but it was something for nothing - Colors not very visible in full days - is played to the APC-40 way, but that's okay because I live so I discovered learns the same time. - The Live version provided is **** m ic, it takes to make a € 220 update: ESSENTIAL if you want something decent in overall Very good machine, I am very happy. But more than that it is Ableton Live that put me a big slap! I put aside Logic and now I created on Ableton as a rough book and then I put all it's own gorgeous. I made ​​sounds that sound alive in record time! I mostly use PCA to play Live. I prefer to work with the LPD8 old school like that I can work my sounds without having to get out the big guns (PCA). And when it's time to repeat my live, I go hop APC and everything is already mapped! ps: My girlfriend gave me the DVD "learn Ableton Live 8" so that I do not have to look how this works for 20 years: Bottom line, in a month that claims to control 70% live, and I 100% pleased with this wonderful APC and its little brother, the APC40! Akai Professional announced that it has launched APC40.com, the dedicated Web site for its APC40 Ableton Performance Controller.